Our new line of Stealth Kitchen Modules (SKM) is not for everybody, just like our Kitchen Workstation Furniture (KWF) is not for everybody. 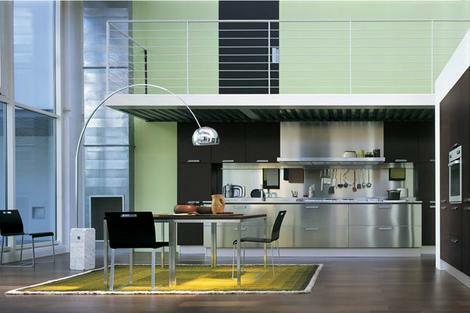 Both lines are Alternative Kitchen Design concepts when compared to standard kitchen design. Even these two lines are very different from each other and yet they have some of the same features too, like the ability to hide ALL the appliances. To learn about the Stealth technology embedded in this line’s features please visit this link, but for this posting, I’m just going to talk to you about just some its points and features. First of all, if it was easy to hide a kitchen in this way, you already wouldn’t have seen it! I love that line. But it’s true. The Stealth line evolved slowly but carefully as we learned from our KWF line how to make beautiful, tough, safe, appliance hiding workstations. There is so much more to this line than just making two foot deep cabinets. 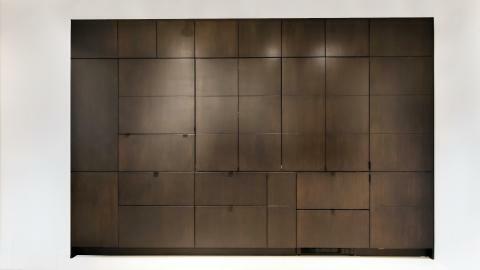 Completely hiding a kitchen behind various styles of door and drawer fronts is a step way beyond normal kitchen design. We came up with the Stealth concept because it was a natural offshoot to what we were already doing with the KWF line. Nobody ever asked us to do this. We didn’t do ANY market research that asked designers if they wanted this. We did this because our UL Listed technology that safely hides ovens combined with the panel system that Subzero came up with for their integrated units made it possible. And I had seen countless examples (see http://www.trendir.com/interiors/kitchen) of kitchens that try to hide everything in all sorts of ways, so we jumped right in! The potential to neutralize the chaos of exposed appliances, cabinetry and counter tops is an option that can revolutionize how we view kitchens. It is time that we really should be reducing the amount of space we live in to save on material resources as well as the energy savings for conditioning that space. Stealth technology allows us to reduce living space by combining living functions into one multi-task living space instead of having so many single use individual rooms. 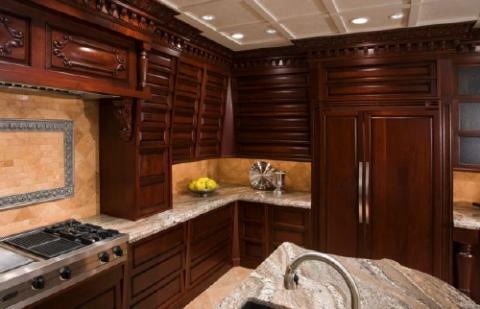 Think of it, just by closing a few cabinet doors, a room does not need to look like a kitchen anymore. Above is an example of a sleek kitchen line manufactured in Europe by Tisettanta. Almost always, the kitchen will be shown with its refrigerator completely concealed, but the sink, cooktop and ovens still exposed. We know it is a kitchen. If it were to be placed in an open living room, it would be very sculptural, but we would always know that it is the kitchen. ESPECIALLY WHEN IT IS MESSED UP! After all, most of us don’t live our lives as pristinely as that depicted in this design photo. We hope that the Stealth kitchens will give people what they’ve been looking for a long time: Choice! With the doors and drawers closed, rooms can have an uncluttered, tranquil look without the trappings of a messy, exposed functioning kitchen. With the doors and drawers opened, a fully functioning kitchen is exposed. And the interior of the workstations can be maintained at any level of chaos that suits the owners, but when the doors are closed, tranquility again. Stealth kitchens are not ‘Smart’ kitchens. A company called Anvil Motion makes an incredible ‘Smart’ kitchen that automatically opens and closes cabinet doors and drawers for you by voice command (see photo above). The cabinets are designed to conceal all the appliances too, (as of yet they do not have UL approval to do this). Sensors and motors know when it is ‘safe’ to close a door in front of the hot appliances. Prices average $200,000 and up per kitchen. Here at YesterTec, we don’t think that people that use kitchens are lazy. We’ve got the time to open doors and drawers. But often, we don’t have a lot of time to cook. So we’ve tried to make our Stealth Modules more efficient to make the act of cooking and cleaning up and storing things easier. So the Stealth Modules aren’t ‘Smart’ but they are intelligent! Their extra depth allows for more storage and countertop space in less width. 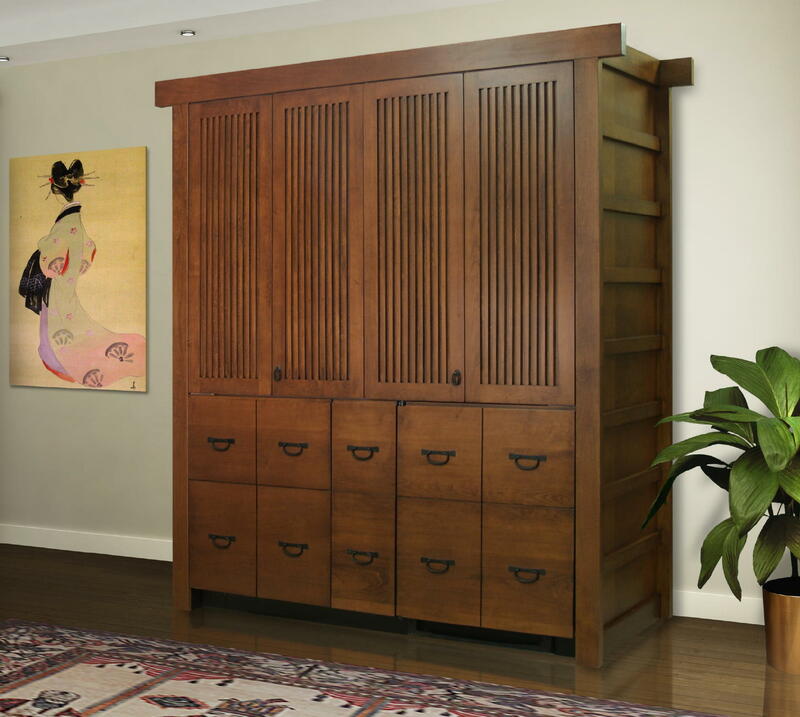 Full height pantry modules replace the typically smaller wall cabinets, and overhead storage modules are available as well for those seldom used items. Full extension drawer slides conveniently bring all of the stored items into view, and they even close softly after they are given a push. Don’t expect to see these kitchens popping up all over, it is going to take quite a while until designers and homeowners recognize this for what it can do for them. We have been desensitized to this option, simply because we are so accustomed to seeing normal exposed kitchens. But just compare the example above to a typical kitchen with all its exposed countertop mess and appliances that are ALWAYS in full view. 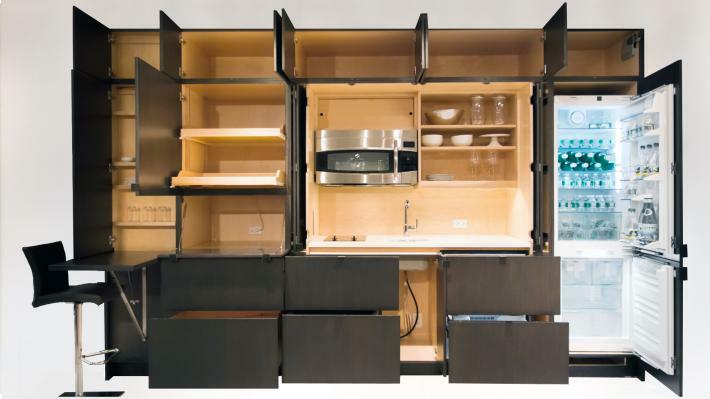 This Stealth Mini-kitchen, instead of being built into a wall, looks like a piece of fine furniture! 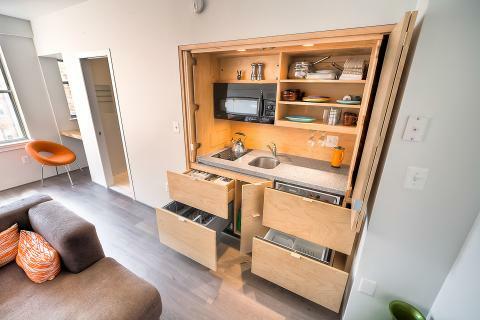 And here is a one room studio in Washington, DC that features a stealth mini-kitchen with a contemporary minimalist look due to its flush natural maple door and drawer fronts. Stealth Kitchen Modules are available not only from us but from Resource Furniture, the innovative design company that features space saving living solutions in their showrooms in New York City, Los Angeles, San Francisco and several Canadian cities. For more information, please contact us or visit Resource Furniture’s New York showroom that has a Stealth Kitchen on display (as shown in the top two images in this article) and designers who can help you with your design needs! And just wait until you see all of the other innovative, space saving products they have! Next ArticleSalt Box Style Home Furnishes the Kitchen!